Samsung’s Galaxy Fold announcement isn’t even a week old yet, and we already have a competitor that is thinner, has a bigger screen, and folds flatter. Say hello to the Huawei Mate X. Launching this very moment at MWC 2019, the Mate X has an 8-inch wraparound OLED display, a folded thickness of a mere 11mm, and a formidable spec sheet highlighted by 5G, a 4,500mAh battery, and Huawei’s in-house Kirin 980 processor. The single OLED display of the Mate X actually serves triple duty. When the device is folded, you essentially have a dual-screen smartphone, with the second display on the rear allowing you to shoot selfies with the main camera or to share what’s on your primary display with a person on the other side. Open up the Mate X, and you get an almost square (but not quite) tablet that has minimal bezels on three sides. One of the sides is reserved for a thicker grip section that houses the three cameras, their accompanying flash, and a push-button latch that secures the folded tablet in a closed position. This approach keeps the thickness of the main chassis down to an impressively thin 5.4mm. Even when folded, the Mate X measures just 11mm in thickness, thanks in large part to the fact it has no gap in its fold. That’s the inherent advantage of folding a screen around the outside rather on the inside: you don’t have to fear creasing the beautiful display. 6.6-inch (19.5:9 aspect ratio, 2480 x 1148 resolution) main display, when folded. 6.4-inch (25:9, 2480 x 892) rear display, when folded. 8-inch (8:7.1, 2480 x 2200) main display, when unfolded. 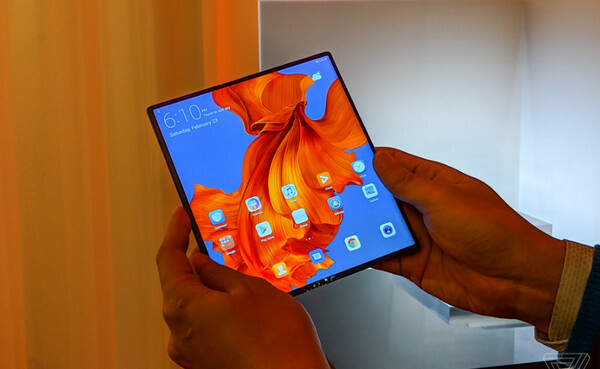 If, like me, you’re questioning why Huawei couldn’t make this phone-tablet hybrid that extra little bit wider in order to deliver a perfectly square display when fully open, I don’t yet have a good answer for that. In fact, as is the trend with all foldables right now, there’s more left unknown about the Huawei Mate X than has been revealed. Is the Mate X’s camera system on par with the one Huawei has put in the Mate 20 Pro smartphone? It carries the same Leica branding, but we don’t know its specs yet. Huawei’s head of global marketing Clement Wong told me today that the Mate X’s camera will be “on par” with the Mate 20 Pro’s performance. It’s not quite the same as saying they’ll be identical, but the Mate X will still have three lenses covering varying levels of zoom. Here are the specs we do know: the processor at the heart of the Mate X is Huawei’s Kirin 980, the same one as in the Mate 20 Pro and the Honor View 20 that I recently reviewed. Both are superbly quick and responsive phones. Alongside that chip is Huawei’s own Balong 5000 5G modem, making for a pairing of 7nm chips with as much performance as early 2019 allows for. 5G isn’t yet a thing for anyone to be excited about, but its inclusion underscores the Mate X’s positioning as a device from the future. It has a dual-SIM card slot, or you can add one of Huawei’s Nano Memory Cards. There’s an impressive 4,500mAh battery inside Huawei’s new device, but we don’t know how far that will stretch in terms of everyday use. It’s accompanied by an upgraded 55W version of Huawei SuperCharge, which will top up the Mate X to 85 percent in 30 minutes. The power key on the side of the Huawei Mate X also houses a fingerprint sensor. 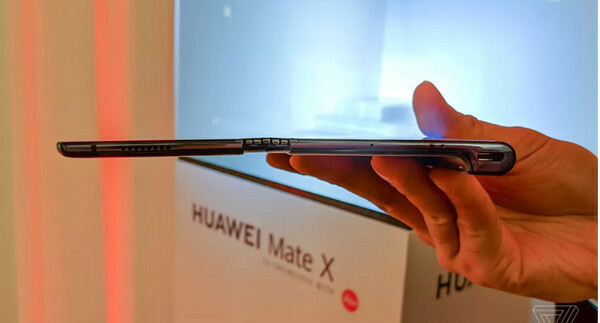 I got to see, but not touch — again, this is a theme with foldable devices so far, no touching — the Mate X up close at MWC, and the most immediately impressive thing for me was how casually the demonstrator was handling it. There was no white-gloves tenderness about his use of the device: he unfolded and folded the Mate X quickly and naturally, and I got no sense of any fragility about the slate. My overriding concern about foldables is that they’ll fail to be perfectly flat when actually opened up, but the Mate X again stands up to scrutiny. Though I can still see small bits of unevenness where the hinge resides, those don’t seem like deal breakers. Huawei has proudly branded its hinge, giving it the title of Falcon Wing design. The company’s engineers have been working on this for three years, according to Huawei consumer group chief Richard Yu, and the design has more than 100 components and has been patented. Unfortunately, I wasn’t able to see a headphone jack on the Mate X, which is an omission it shares with the Samsung Galaxy Fold. Huawei is pricing the Mate X at €2,299 with 8GB of RAM and 512GB of storage, and releasing it from the middle of this year.